What's the real story behind the glossy commercials for Kentucky Fried Chicken? Is it a wholesome tale of happiness and health? Or a catalogue of cruelty and suffering which Kentucky Fried Chicken don't want us to know? Hidden behind the ads, the victims of Kentucky Fried Chicken suffer lives of degradation and distress. The natural needs and instincts of the birds are ignored altogether. Right from the hatchery until slaughter, they are subjected to a succession of cruelties. The chickens undergo mutilation, crowding, injuries, diseases, debeaking, forced molting, antibiotics, ammonia burn and heat stress. The combs and toes of breeding chickens are cut off. The birds are constantly exposed to "the excremental assault". Chicken feathers, guts, and waste water, which normally need to be discarded during processing, are routinely "recycled" back to the layer and broiler houses as feed. Industry experts believe that along with unclean slaughtering and processing techniques, this enforced cannibalism is leading to the rampant salmonella epidemic in US poultry plants. Abuse doesn't stop there. In the name of "poultry science", horrific experiments are performed on live animals in university departments. Meanwhile, male chicks born to laying hens by killed en masse. The chicks are weeded out by "chick-pullers". The young birds die by being suffocated, gassed or ground up while still alive. "Poultry processing plants" are factories of cruelty and killing on a scale it is difficult to comprehend. From the perspective of the distressed animal, life really is "an eternal Treblinka". The victims of our last finger-lickin' meal are first hung alive and upside-down on metal hooks. They then pass through an apparatus which "ideally" kills them quickly by removing the head with a whirring blade; or alternatively they perish, agonisingly, by immersion in an electrical-shock tank. The doomed birds can see their fate and that of their fellows as they approach the killing station. They are distraught and terrified. 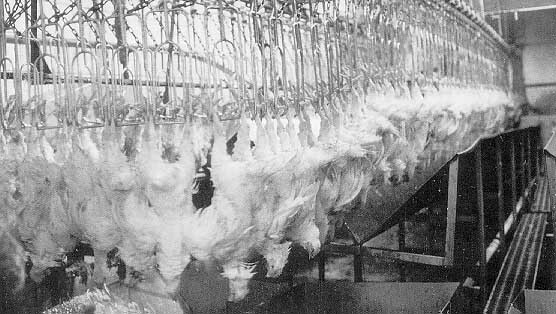 So-called "redskins" are those chickens which - on the conveyer belts to their deaths - missed not only the brine-filled electrified stunning trough, but the knife that was to cut their throats. Their deaths occurred in the scald tank where feathers are loosened before plucking. Industry throws aside piles of them every day. One has to ask the question: does the nice taste of dead animal flesh morally outweigh the frightful cruelties our meat-eating habits entail? This isn't an ethical discussion Kentucky Fried Chicken is keen to promote. by Karen Davis Summertown, TN: Book Publishing Company, 1997. 175 pages. $12.95 pbk. "We recognise, I hope, our special responsibilities to the aged and infirm, towards the sick, the mentally subnormal and the physically handicapped. We say that such sentient creatures that are less able to care for themselves deserve our special care and support. The same argument applies to children - and we as adults claim we recognise special duties towards them. 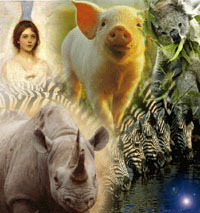 If this is so, then why do we not recognise our special duties towards individuals from less clever species?"